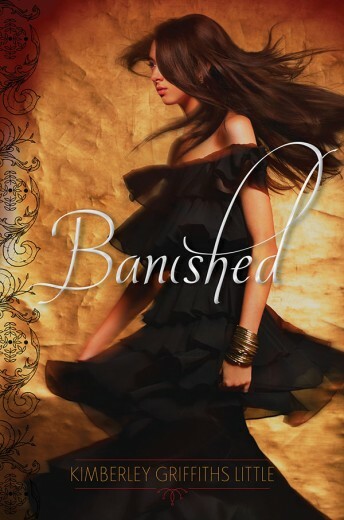 BANISHED, the second in Kimberley's Forbidden Trilogy hit shelves earlier this year, praised by fans and reviewers! You write young adult, middle grade and now romance books, promote your work brilliantly, and offer support to other writers. What guidance might you offer others struggling to balance writing with the "business of authordom"? Kimberley said...The aspect of trying to keep the career going and having to do so much of my own marketing and publicity has been the hardest to accept…I’ve come to realize that I spend at least three times more of my days in career activities that are not actual writing/revision…Nonstop Email, Social Media (Twitter, FB, Tumblr, Goodreads), personal blog, updating my website, book launch parties, Author Newsletter, School Visits, Power Point presentations, guest blog posts, interviews, brainstorming/writing proposals for new books, research, outlining, beta reading, mailing giveaway prizes, designing and ordering swag, creating Teacher’s Guides and Book Club Guides, filming Book Trailers, creating teaser graphics, writing author bios, taking author photos, attending conferences, etc. But sloooowly and with each published title your books and your name becomes more well known. It’s much harder for writers who don’t get the big promotional money from their publishers. I try to think of it as making connections with readers one person at a time. I believe that the best word-of-mouth tool is to keep writing and publishing. As long as your editor doesn’t switch houses or your agent quits to start a catering business. Just kidding! But only slightly. The reality is that most writers end up with 2-3 different agents during their careers, and most authors are orphaned by an editor at one time or another. EVERY book is hard to write—BUT it is a fact that with every book you write, your craft gets better. It’s the absolute truth. And with every book published your readership WILL expand. Those writers who are passionate and keep working hard at their craft as well as genuinely connecting with readers will have success. You probably won’t make a million bucks (less than 1/10 of 1% of writers ever do), but your stories will be read and you will get fan mail, even if it’s only occasionally—and there is enormous pleasure in that. I’m trying to make a conscious effort to take satisfaction and pride in my accomplishments instead of living envious of other’s successes. To stop feeling discouraged and stressed out all the time—and to start taking joy in the journey and in watching my little dreams come true. I KNOW YOU'LL WANT TO HEAR MORE FROM KIMBERLEY (she is awesome) SO HERE ARE SOME MORE VIRTUAL SPOTS TO FIND HER: FORBIDDENtrailer; Facebook; Twitter @KimberleyGLittl; AmazonPage.